The State Flag of South Australia, which is flown from Government buildings and vessels, was authorised by Proclamation on 13th January, 1904, and comprises the Blue Ensign with the State Badge in the fly. In a 1829 mm x 914 mm flag the Badge is 406 mm in diameter and is located in the centre of the fly half of the flag. The State Badge is described as “the Rising Sun, Or, with thereon an Australian Piping Shrike displayed Proper, and standing on a staff of gumtree raguly, gules and vert”. The State Badge, which is incorporated in the State Flag, is for official use by the Government of South Australia only. Under the Unauthorised Documents Act 1916 no person can print, publish or manufacture the symbol without permission. The symbol cannot be used for commercial purposes. The State Coat of Arms conferred in a proclamation gazetted on the 19th April, 1984 replaces an earlier Coat of Arms conferred by King Edward VIII in 1936. The Armorial Bearings are described heraldically as:- for Arms, Azure on the rising sun depicted as a roundel Or an Australian Piping Shrike displayed and standing on the staff of a Gum Tree proper and for the Crest on a wreath Or Azure and Gules Four sprigs of Sturt’s Desert Pea proper the Shield upon a Compartment comprising A grassy mount and in front of two Vines growing therefrom each entwining their stakes proper on either side thereof stalks of Wheat and Barley and the dexter side scattered with Citrus Fruits and lying on the sinister side two Cog Wheels with between them a Miner’s Pick also proper together with on a Scroll the name “South Australia”. The State Coat of Arms is for official use by the Government of South Australia only. Under the Unauthorised Documents Act 1916 no person can print, publish or manufacture the symbol without permission. The symbol cannot be used for commercial purposes. The plant formerly known as Clianthus dampieri was first collected by William Dampier when he visited the north-western coast of New Holland in the seventeenth century. The specimens he collected are now in the Herbarium at Oxford University. Sturt’s Desert Pea is found over a greater range of South Australia than almost any other plant and is probably the most striking and distinctive of all the plants of Inland Australia. The major portion of this State receives less than 381mm of rain per annum and it is in these regions that Sturt’s Desert Pea thrives. Historically the plant is associated with the early explorations of South Australia. Captain Charles Sturt in his “Expedition into Central Australia” describes the finding of this plant in 1845 “towards Coopers Creek”. Since that time his name has always been associated with our Floral Emblem. Its distribution covers various parts of the Flinders Ranges, Gawler Ranges, the Lake Eyre and Lake Torrens Basins, DeRose Hill Station, Granite Downs, in the far north, Kingoonya, Yudnapinna, Watson and Ooldea in the far west, and Curnamona and Koonamore east of the Flinders Ranges. The nearest points to Adelaide that it grows naturally are Burra, and Orroroo. Sturt’s Desert Pea is a member of the legume family and because of its habit of growth and distinctive long and curiously shaped flowers it is highly ornamental. The flowers are usually coloured a scarlet or blood red with a central blue-black blotch or “boss” in clusters of up to six or eight which are held erect on a short stem above the plant. Variations in colouring are recorded from pure white to pink and through to purple. Such flowers may or may not possess the black blotch. The plant is picturesque and most attractive with its soft grey foliage produced on the many prostrate stems often up to 1 – 1.5 m in length. Flowers are produced every 10 – 15 cm along these stems and the plant in flower is beautifully set off by the attractive grey pinnate foliage. 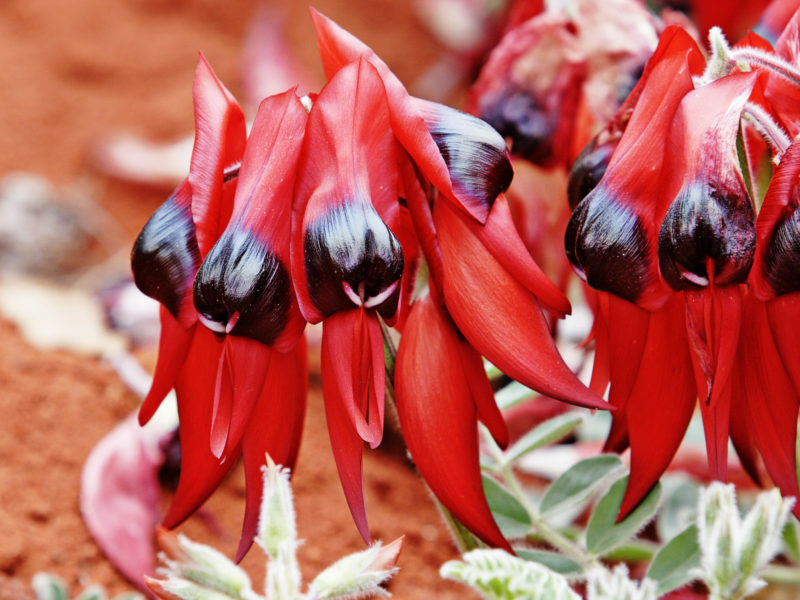 Sturt’s Desert Pea can be grown readily in a very well draining potting mix or soil mix. The seed should be sown in September or October but because the coating of the seed is impermeable, it should be rubbed between sand-paper or a file or the seed nicked with a knife or soaked in hot water (not boiling) to aid germination. The plant needs a warm well drained position and it should not be disturbed after planting. The remarkable outline, shape, and startling colour of the flowers and the leaves of Sturt’s Desert Pea lend themselves to be easily incorporated into design emblems representing South Australia. The Hairy-Nosed or Plains Wombat (Lasiorhinus latifrons) was adopted by the Government as the faunal emblem of South Australia on 27 August 1970. It is a marsupial mammal indigenous to Australia and totally protected in South Australia. The generic name, Lasiorhinus, means hairy-nosed and the specific name, latifrons, means broad-fronted. The Hairy-Nosed Wombat is a thick-set powerful mammal with a broad blunt head, small pointed ears, short muscular legs, strongly clawed feet and a rudimentary tail. It has soft grey-brown silky fur. Adults are up to 30cm high, 75 to 95cm long, and weigh between 18 and 32 kilos. The animal is adapted to life in semi-arid and arid zones and, apart from some small colonies in the south-east of Western Australia, is confined to South Australia. It is most abundant on Eyre Peninsula, the Gawler Ranges and the Nullarbor Plain. Smaller colonies occur on the west bank of the Murray River and on Yorke Peninsula. The Hairy-Nosed Wombat is essentially a plains dweller inhabiting many combinations of soils and vegetation, especially open woodlands and shrublands. It is a very powerful digger – only deterred by soft sand and unbroken sheet limestone – and excavates deep cool, humid burrows which are essential for survival in its hot, waterless environment. The wombat feeds exclusively on plant material which often is its only source of water. A single young measuring only 2cm in length, is born between September and January and remains entirely confined to its mother’s backwardly directed pouch for the next five months. After this, the young ventures out for increasing periods, continuing to suckle while accustoming itself to adult food. Young wombats continue to live in their mothers’ burrows for a further two years before being driven out.